As expected, a country with a small population has grabbed the top medal position when Grenada (population, 104,000) grabbed a gold. 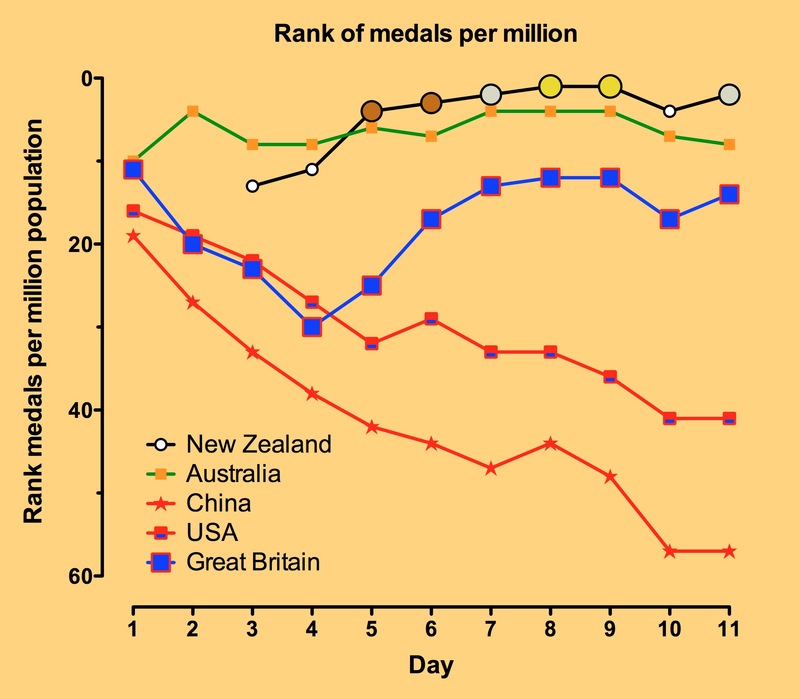 WIth a medals per million score of 9.6 they are only likely to be beaten by a country with even smaller population. Meanwhile, Jamaica has moved into 5th position with 5 medals, all in athletics. If this was health stats, then these two situations would be examples of “outliers.” Worthy of study in and of themselves, but having a distorting influence on the overall population statistics. Also of interest is that perhaps Great Britain is reaching a plateau, meanwhile China continues to fall as sports they are not traditionally strong in dominate the second week of competition.